When deciding on your next storage addition it’s important that you consider the level of integration that you will get when implementing your new data repository. With the SnapServer SAN S2000 you can rest assured that all aspects of the product were designed to integrate and interoperate with all of your Windows Servers. With an intuitive Windows management interface and provisioning tools that make creating and managing your new storage device effortless, you can spend more time focusing on non-storage related planning, troubleshooting and problem solving. 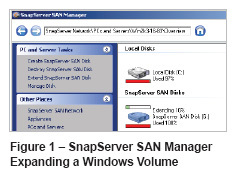 Managing your Windows iSCSI SAN may seem daunting, but with the easy to use SnapServer SAN Manager for Windows, all aspects of managing your iSCSI SAN become effortless. The SnapServer SAN’s integrated management interfaces and wizards guide you through every aspect of creating and managing your storage so you’re no longer burdened with the arcane complexities of provisioning your storage or managing your mirroring and replication tasks. Remember that you’re not constrained to the capacity you initially purchase either. Add E2000 expansion units to your existing S2000 to scale your SnapServer SAN up to 120TB. Besides the integration with VSS for Application Consistent replication and backup support, administrators also have the option of deploying complete Active-Active Failover solutions with SanpServer SAN products. Support for Microsoft Cluster Server gives administrators additional flexibility to deploy data protection scenarios that best meet their business needs. Windows Hype V Servers are the hottest neww deployments Microsoft virtualization technology. Supporting direct access for guest VM’s to iSCSI targets without having to expose the target to the Hyper-V host allows administrators another layer of abstraction and security for their iSCSI SAN’s. Extending the SnapServer SAN’s VSS provider to also support the Hyper-V VSS Writer or Replication s and Backups of Virtual Machines give another level of data protection and disaster recovery. The Active -Active Failover support in SnapServe SAN’ is also extended for clustered Hyper-V Servers giving he ultimate in flexibility and data protection for virtualizing with Microsoft technologies.